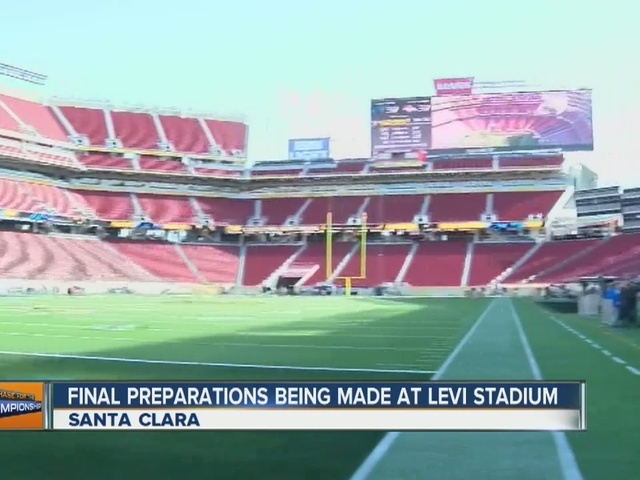 Just 19 months after it opened, the San Francisco Bay area's new stadium, Levi's Stadium, is hosting Super Bowl 50. Let's go inside and check out the Super Bowl home. As the 49ers were cleaning out their lockers at the end of the season last month, grounds crews were removing the sod. The entire sod was replaced with 29 truckloads of specially-designed grass from a farm owned by West Coast Turf in Livingston, Calif., 117 miles away. The New York Times said changing the sod became standard procedure for the N.F.L about 25 years ago. Yes, the Denver Broncos mascot Thunder will be at the Super Bowl. Thunder is being driven to Santa Clara, California. NFL Director of Events Eric Finkelstein said his team was ready for whatever requests the Super Bowl teams made. "The Broncos asked for the horse to be part of the festivities," Finkelstein said. "The Panthers have a drum. We try to make this as much a home game as possible for both teams." The Broncos second mascot, Miles, will also be at the game. Finklestein said the stadium lost some seating due to the Super Bowl set-up, so it also added some. For a 49ers game, there's just under 70,000 seats. For the Super Bowl, it'll be right around 70,000. Where are those "extra" seats? We spotted them at the top of the first level -- it's the black seats with a black railing around them. Secret No. 4: More buildings were added INSIDE the stadium. Fans may notice two new buildings -- one the southwest corner of the stadium and one on the northwest corner of the stadium. The three-story buildings were built to house international media who are covering the game. Secret No. 5: The stadium may be painted in 49ers red, but it's really "green." That NGR bridge fans walk under to get inside the stadium has solar panels on top. There is a SAP Tower inside -- it has a "green" roof with 16 different types of plants on it. There are even more solar panels up there and throughout the stadium. There are also low-flow plumbing fixtures in the stadium that use 40 percent less water. That sounds good, but what does that mean? It turns out, if you download the stadium app, you can order food, drinks and merchandise. At most games, the items are DELIVERED TO YOUR SEAT! However, at the Super Bowl, only drinks are being delivered. If you order food and/or merchandise, you'll have to go pick it up. But wait, there's more. The app even has instant replay from multiple angles. Walk by the cheerleader's locker room and you'll spot new signs this week. That's because the halftime band, Coldplay has been given the cheerleader's locker room to get ready and watch the game. Right now, commercial planes fly over the stadium on their way to San Jose International Airport. But, "air traffic will be limited over the stadium on game day," Finkelstein said. It's probably no surprise, but in addition to the planes flying over the stadium this week, there are also military helicopters and police helicopters monitoring the area. Did you hear about this? The grounds crew painted the Broncos logo in the wrong end zone last week . That meant they had to paint it in the correct end zone, THEN paint the Panthers logo over the Broncos remnants. The Broncos and Panthers play Super Bowl 50 Sunday.